Learning is a treasure which will follow its owner everywhere. The main focus in every classroom at Kirstenhof Primary School is LEARNING which we as far more than imparting knowledge onto children. As a school we strive to influence children’s attitudes towards learning, with an aim to develop a desire and passion within them to want to learn. We believe that when children love to learn they will enjoy their primary school years more and set themselves up to excel in the future. We endeavour to equip children with the necessary skills required to thrive in the diverse world in which we live today, where critical and independent thinking, creative problem solving and working with relevant content are essential. The teachers at Kirstenhof Primary School are passionate, innovative and creative in their approach towards presenting lessons. They constantly encourage and celebrate collaboration and communication. They ensure that the children are fully engaged in relevant content, encouraging creative problem solving and critical thinking. Lessons are designed to continually challenge and grow these skills throughout the school. Along with learning these essential skills, each term we select a new ‘theme of learning’ in which all children participate. Some of the ‘learning themes’ we focus on include responsibility at home and in the classroom, respect for yourself and others, friendship within existing groups and developing new friends, leading in the classroom and on the sports field, team work within the classroom and in our school House system, courage to have an opinion and standing up for what you believe in, as well as discovering your personal excellence and striving to attain it. 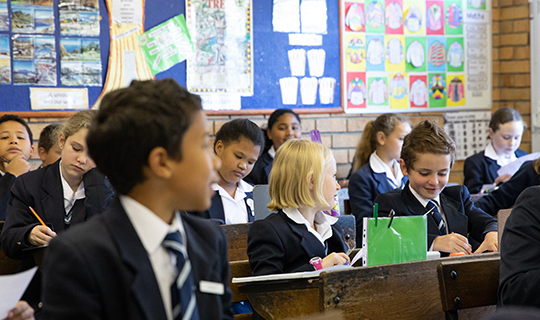 Every teacher at Kirstenhof Primary School promotes LEARNING in their classrooms. KPS children enjoy a warm and welcoming atmosphere that celebrates discovering new ways of learning through creative problem solving, collaboration and communication. We believe that creating opportunities for children to learn and communicate develops these skills and creates children who have a passion for learning, enjoy coming to school and have the necessary skills required to thrive in an ever-changing world.